Good news for the burn victims or smooth and durable skin lover. A new innovation from MIT (Massachusetts Institute of Technology) has successfully developed artificial skin and nerves are normal physiological functioning. 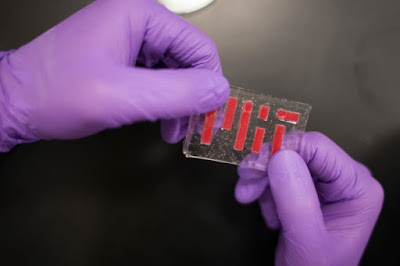 MIT research team, not only successfully developed the artificial skin, but also ensures that artificial tissues function like a normal skin, in which there are blood vessels and nerves. This innovation is expected to help burn victims, or anyone who needs a new skin tissues. This innovation begins with the success of developing a method to bind the gelatin (hydrogel) with an elastic polymer material (elastomer). Both are basic materials to make artificial skin cells, neural tissues, and long lasting contact lenses. To note, if we make jelly (hydrogel), within a certain period, it will evaporate, leaving the shrinking masses, harden and shrivel, with a form that is not attractive. The same applies to the hydrogel. Due mostly made of water, the hydrogel will expand when it absorbs water and shrinks when it dries and wrinkles. Now, MIT researchers find ways to prevent the effects of dehydration of the hydrogel. They use a special technique that can cause us to be able to make the long lasting contact lenses, elastic microfluidic devices, flexible bio-electronic devices, and even artificial skin. The team leader named Xuanhe Zhao of the Department of Mechanical Engineering of MIT devised a method for binding hydrogel and elastic polymer (elastomer) such as rubber and waterproof silicone. They found, among the hydrogel with a thin elastomer layers provided retaining water trap which makes hydrogel remains moist, flexible, and powerful. The results are published in the journal Nature Communications on July 2016. Zhao said the team was inspired by the design of the human skin, which has bonded the outer epidermis and dermis layers protect. Epidermal layer acts as a shield that protects the dermis, nerves, capillaries, as well as the muscles and organs of the drying effect. Hybrid hydrogel polymer-elastomer designed as bonding epidermis and dermis of the skin naturally. In fact, this hybrid is stronger and elastic as to be used for a variety of interests. Zhao and his team developed a hydrogel-elastomer design models. In addition, the researchers explored a wide range of applications for hybrid materials, including skin, blood vessels, and artificial neural.